One of my favorite traditions for Ukrainian Easter is baking Paska, a special bread, which takes center stage on the breakfast table for Easter, and is the main part of the Easter Basket, among other special foods, being blessed on Holy Saturday, or Easter Sunday. I already shared with you my favorite Paska recipe, and many of you asked about the kind of pans to use for baking this bread, since the traditional Ukrainian Easter Paska should be round, in shape. I decided to write this short post, and share some ideas of the kind of bakeware to use for baking paska. The above pans are my favorite ones to use. They have quite thick walls and bottom, are just the right size for paska for my basket (the largest one), and the smaller ones were always great for small paskas for my children’s baskets. The largest one is 6 1/2 inches in diameter, and 3 inches tall. 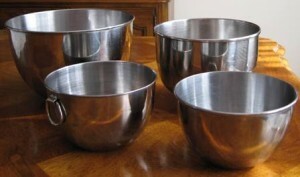 These are stainless steel mixing bowls, which also are great for baking paska. These are larger in size than the first set, they have thinner walls, and the bottom is not as flat, but still very convenient to use. 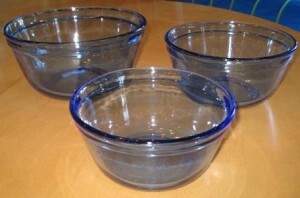 These are glass bowls by Pyrex. Very convenient to use for baking paska, but you will need to allow less time for baking, than in the other pans. Also, you have to be careful with handling these hot glass vessels, as not to burn yourself or place them on a cold surface, so they don’t crack. 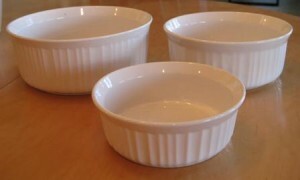 These containers are made by Corning Ware, and excellent for baking paska. May daughter used these for her paska, and it worked like a charm. You need to make sure to grease well the upper lip of the posts, and dust it lightly with flour, as it flares out, so the paska does not stick, making it difficult to remove. You might need to loosen the edges up with a knife, so you do not damage your paska during removal for cooling. Here is a clay flower pot, which was suggested to me by one of my readers (this one is for display only, as I am actually using it for my plant), is also a great container to use for baking paska. She recommended to use olive oil to grease the inside, before filling it with paska dough. I have yet to try to use this idea for baking paska, but it sure makes perfect sense, since I am aware of terracotta cookware which some cooks highly recommend. 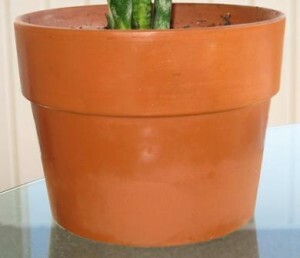 I would take a little more careful handling, so you don’t scratch your work surface, as terracotta pots usually do not have very smooth bottoms. Some bakers use large coffee cans ( like those from Folgers or Maxwell House), line the inside sides and bottom of the can with a thick brown paper (brown paper grocery bags), greased of course, and cut about 1 inch taller than the can,to prevent the rising dough from spilling over. These paskas are nice and tall, thus easy to arrange in an Easter Basket for blessing. I just learned something new today…on another site…that for those who love their paska tall, there are beautiful pots for these bakers, by Bain Marie, and available via Amazon. Tip: If you are using different sizes of bakeware, at the same time, keep the larger ones towards the back of the oven, and the smaller ones closer to the front, as the smaller ones will be done sooner, and more accessible for removal from the oven. The pots that are your favorite.. what kind (brand) are they?? and thank you for the recipe !! You are most welcome for the recipe. I hope you will enjoy this paska as much as my family does. I just checked my pots, and unfortunately they do not have any brand markings on them. I purchased them a very long time ago in a small kitchen type store, and they might have been made in Europe (possibly Poland), since I have seen similar kitchen items with stickers, stating that they were made in Poland. I remember my Baba baking her Paska in coffee cans and old pots. What great memories. Yes, I used to bake my paska in coffe cans as well, but they are very thin, so you really need to line them with greased brown paper to prevent the paska from burning. Coffee cans bought this year don’t work. (I misplaced my old ones). They have a rim at the top, making it impossible to remove them without breaking off the top. Any suggestions, assuming I stay with the coffee cans? Sorry to hear that. However, when I was using coffee cans I also lined the sides and bottom with a thick brown packing paper greased well with Crisco (like the old grocery bags used to be made of). The paper cylinder was about 1 – 2 inches taller than the can, so when the bread was rising it did not overflow to the sides. This should solve your problem. I’m so sorry to hear that. I used this recipe for my paska and hardly ever have problems with cracking. I understand that uneven heating in the oven makes the dough rise lopsided, or overcrowding in the oven will also create same issue. The crack in the middle may be created by insufficient rising of the dough before baking, or the dough is too cool before baking, so the top bakes faster creating a crust, but the middle is cool and then pops through the top, or the type of four you are using. Different flours have different gluten ratio. I use all purpose Pillsbury flour, and also tried King Arthur flour, which gave me great results as well. You also might have too much flour. When the weather is rainy or humid, flour absorbs moisture and cup measures differ, that is why lots of bakers weigh their flour rather than measure with cups. Korovai breads can be stacked up, and so heavily decorated with birds, cones, etc, that small crack imperfections can be creatively hidden. I hope this helps, and your next project will be a success. For “new” coffee cans use one of those can openers that take the top of the can off so there’s no super-sharp edge on which to cut yourself. If the can is too thin, wrap it evenly in tin foil around the outside. Thank you so much for sharing such a useful tip. Hopefully most of our paska bakers will be able to find other suitable containers to bake their paska in. I need to purchase pans to bake paskas in. What is the brand of the metal pans you showed in your message and where I can I find them? Can you tell me where to buy the paska pans?Also what brand are they? 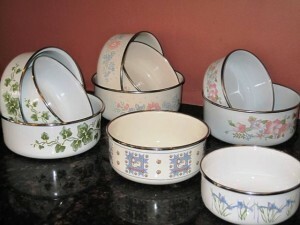 These nesting mixing bowls were made by KOBE company for JC Penny Co. Many people use Coffee Cans as well, and line them with parchment paper. Any idea where I can get the stainless 2# coffee cans from to bake my Easter bread in? Two years ago I found a store that sold the Easter bread pans, but am unable to find it this year. 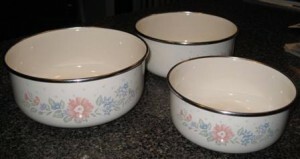 I am using the same baking pots from year to year…does this mean that you don’t keep your, or you just found them two years ago but did not buy them…? I would suggest to try looking for something like that on Ebay, Salvation Army stores, Goodwill stores, department stores….you might find some like the ones I posted about.